A Canadian project involving more than 300,000 volunteers providing health information over 30 years is “open for business,” with a third round of funding beginning last month (April). Participants in the Canadian Partnership for Tomorrow Project (CPTP) provide information about their lifestyle, environments, and family medical history, with the aim of helping researchers understand the factors that can increase the risk of cancer and other chronic diseases, opening the way to support people to change these factors, and reduce their risk of developing disease. “Rather than curing cancer, you prevent it in the first place. We need to focus on primary and secondary prevention – preventing or stopping cancer before it progresses,” School of Population and Public Health (SPPH) Associate Professor, and co-lead of the British Columbia regional cohort, Trevor Dummer said. The study is population-based, and longitudinal, meaning results could be generalized, helping researchers understand the development of a disease over time, he said. About half of the participants in the CPTP also submitted biological samples, usually blood, although the Atlantic PATH project also collected toenail clippings to investigate concerns about exposure to arsenic in drinking water. This led to a Guinness World Record for the largest collection of toenail clippings, as well as one of the more stomach-turning jobs in the world: processing the samples by washing them with acetone and water, and determining their weight. About five research projects had been approved using BC Generations data, Dr. Dummer said, including a study by SPPH Professor Lawrence Frank looking into how the built environment impacts healthcare costs. 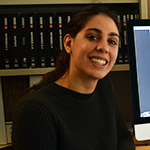 Dr. Dummer and SPPH MSc student Amina Moustaqim-Barrette are developing a project looking at cancer screening rates across provinces, to determine whether there are differences in uptake, and variations between populations. Ms Moustaqim-Barrette said she became interested in the project as a result of a family history of cancer and seeing first-hand the barriers people faced to accessing resources such as screening. CPTP was developed as a pan-Canadian research platform for national and international researchers. Ideally, CPTP would see many approved projects with different investigators, Dr. Dummer said. Students interested in working with Dr. Dummer on this project or discussing this area of research can email him here. BC Generations is hosted and supported by the BC Cancer Agency.